Fellow couldn't tell me from Hawkwing's toenails. 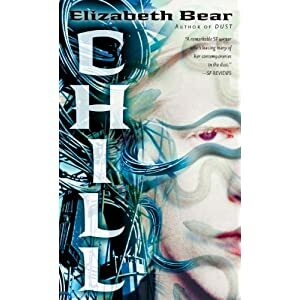 Chill is the second novel in Elizabeth Bear‘s Jacob’s Ladder trilogy. Dust ended with the Jacob’s Ladder barely escaping annihilation via nova explosion. Perceval had won captaincy of the ship by the skin of her celibate teeth; Rien had sacrificed herself to integrate the ship’s “angel”; the Conns were relearning the parameters of the ship’s original mission; the Ladder needs to be resettled, rebuilt, and re-mapped; the Conns’ inter/intra-warring is not yet done. Perceval and her allies – and her enemies – are incapacitated by recovery and by grief. If I were them I’d've given up the day as lost and gone back to bed. Dust focused on the two heroes – Rien and Perceval – on their journey through the ship to prevent a war and bring their allies together to negotiate a cease-fire. Against the two women we see Jacob Dust, the ship’s sentient archive, intent on gaining complete control over the ship’s integrated AI, and control too over Perceval, to captain under his charge. But if Perceval became Captain, Rien submersed herself in the AI, integrated the fractured systems and placed the final product at Perceval’s disposal. Dust was tightly structured in the dual heroes’ quest against a single ultimate opponent who could not stand against their combined martyrdom and authority. Chill opens the stage out to more characters, giving us a fragile fellowship of Conns and more jaded, even sophisticated points of view. Characters whom we have only seen through Rien’s and Perceval’s eyes now have their own individual voices. While it is far less romantic, it is much more interesting. Perceval and Rien (such as Rien is and was) are much more peripheral – Chill’s protagonists are older Conn relatives, whom we see through their own eyes as they try to support the ship or run after their own sister/granddaughter/etc. (the Conns are so incestuously intra-related I never bothered to keep track of who was related to whom how). This means that we have more perspectives on the events of the novel, and a greater geographic questing over the worldship, damaged as it is. All this running around and naval-gazing has an immediately obvious disadvantage – the novel’s pacing is somewhat choppy, with no easy fix. Bear also chooses to let significant events occur in the invisible-to-readers blink of an eye, reported to us only after the fact. Those particular scenes worked better for me on the reread, because the first time I would wonder if I had skipped a page or two. Add in a monster (trailing behind Jacob’s Ladder the way daddy issues trail behind the Conns) whose perspective is narrated in the second person – look, I liked the monster, I want everyone to know that there was a monster, but the second person is not always the best way to place a monster in its alien monstrosity. For all these prosaic flaws, Chill is still a good sequel to Dust, particularly because there are so many avenues for Grail, next and last in the series, to explore (literally and metaphorically). Chill has monsters, incestuous and murderous faux-feudalists in space(! ), angels, Captains, necromancers, coincidental wooly mammoths and snakes. I would not recommend this as a stand-alone, but as the second, bridging work in a series, it is just right. If you read and liked Dust, I strongly recommend Chill.